Leccare Lollipops aren't just another brightly colored, dubiously flavored, bulk pack of candies. These small-batch, locally sourced, imaginatively flavored lollipops are the product of Kimberly Hadlock, a candy maker who spent 20 years as a mixologist and 15 years as a photographer. Combining her creative palate and clever eye, Hadlock has created what are probably the most gorgeous, most creatively flavored lollipops you'll ever come across. From Sweet Sriracha to Pumpkin Spice Latte to Marshmallow & Hibiscus, Hadlock's combinations will blow you away. Her confections are embellished with real flowers, flecks of spices, nonpareils, crumbs of raw sugar, swirls of cream and flakes of sea salt, all in a variety of shapes. It can take Hadlock up to three months to finalize one of these carefully curated combinations. With the incredible variety of flavors, shapes, colors and patterns, these lollipops are any aesthete's dream come true. The project started when Hadlock thought she'd try her hand at making rock candy. When that immediately failed, she still had all the ingredients, including a 20-pound bag of sugar laying around. Thus, the lollipops were born. Today, the business consists of Hadlock and her confectionary consultant Denise LaFriener, who also handles new clients. Leccare gets its ingredients from local distributors and, for specialty flavors and embellishments, from other Etsy shops. As Hadlock said, "I know that my business is helping support other small businesses and I love that." As if Leccare's 35-plus flavors and countless options to combine these flavors in custom gift boxes aren't enough, you can also create your own custom flavors. 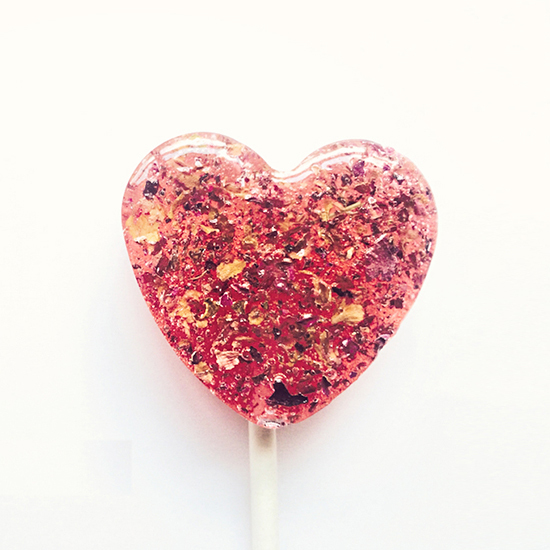 You can buy Leccare Lollipops on Etsy and get your fill of prettiness from Leccare's Instagram.